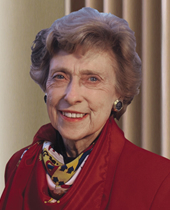 In 1997, Corinne “Lindy” Boggs was appointed by President Clinton as the first woman to serve as U.S. Ambassador to the Vatican, a position she held until March 2001. Firsts are a recurring theme in Lindy’s career and have formed an impressive foundation for her exceptional achievements. … the first woman from Louisiana to be elected to the U.S. House of Representatives in 1976, serving nine terms until she left the post in 1991. … the first woman to chair the National Democratic Convention, presiding over the nomination of President Jimmy Carter. … the first woman to serve as a Regent of the Smithsonian Institute. While in Congress, Lindy was a founder and Secretary of the Congressional Women’s Caucus, a powerful bipartisan force initiating policies for critical issues like Social Security, pensions and education. She served on the Appropriations Committee and on the Select Committee on Children, Youth and Families, where she chaired the Crisis Intervention Task Force. Lindy spearheaded legislation to give women access to credit and fought for civil rights, equal pay and helping the underprivileged. Her work was instrumental to establishing the House of Ruth, a safe haven for victims of domestic violence and their children. Even after her “retirement” from Congress, Lindy posted a series of positions that most “active” people would envy, such as her recent positions as Vice President of the National Science Foundation and Vice President of the National Archives. Her special interest in scientific research and technological development earned her a place on several scientific committees – not easy for someone who’s not a scientist! The depths of her contributions locally and to all of America, her courage and perseverance, her insight and leadership, continue to inspire us all. For that, we are proud to present Ambassador Lindy Boggs as your game eight Tenet Choices Champion.